Toyota's 8-Series large capacity diesel 8,000-17,500 lb. , along with the company's 8-Series large capacity gasoline forklifts and 8-Series paper roll special models combined, received the bronze award in the Material Handling Systems category. Recognizing innovation in manufacturing products, the annual "Product of the Year" program is now in its 26th year. According to the publication, this award sets the manufacturing and engineering industry standard for new product innovation. 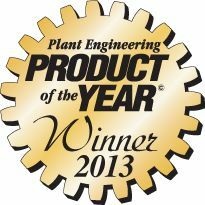 Award recipients are determined based on votes received from the qualified subscribers of Plant Engineering magazine, whose readers include plant managers and plant engineers. This achievement was formally acknowledged at the 2014 Engineering Awards in Manufacturing dinner, hosted by CFE Media LLC, publisher of Plant Engineering, in Chicago on March 31, 2014. "We are pleased that Toyota's lift trucks have been recognized for product innovation and their role in helping plant managers improve efficiency and increase productivity," said Jeff Rufener, president for TMHU. "As a reader-based award, we are especially honored that Plant Engineering's audience of qualified professionals voted for Toyota's lift trucks as their preferred product of choice." Toyota's latest 8-Series large capacity lift truck line of cushion and pneumatic tire models are powered by two new Toyota-designed and built 4-cylinder, high-performance engines. Designed for customers in both indoor and outdoor applications like the paper, lumber and concrete industries, and large distribution centers needing to move heavy loads, the 8-Series line-up honored includes 8,000 to 17,500 lb. pneumatic models with diesel, LPG, gasoline and dual fuel engines, along with cushion LPG-powered models with 8,000 to 15,500 lb. lifting capacities. Thanks to new engineering design advancements, Toyota's 8-Series engines provide the same or greater horsepower and torque as an inline 6-cylinder engine, while achieving greater fuel savings. In addition, Toyota took a bronze award for its 12,000 lb. paper roll special model lift truck option. To meet the paper industry's need for reduced paper roll handling damage with maximum efficiency, Toyota offers factory-installed paper roll clamps that are available in a wide range of configurations to handle multiple diameters, weights and types of paper.